Get your squad together for an insane night of Bingo, lip sync battles, silly dance offs, crazy props, confetti cannons, and bad decisions. Shenanigans are mandatory! 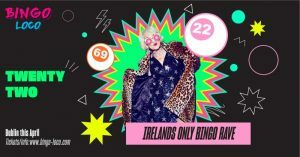 We are the runaway child of traditional bingo complete with rave rounds, lip sync battles and dance offs. The conventional Bingo Cartel don’t like what we do. We don’t care. We are bringing bingo kicking and screaming into a full on party rave! We’ve got the ball’s… the bingo balls to make your roar so loud you’ll definitely lose your voice. Previous prizes include: Trip to Vegas & Coachella, dildos, blow up dolls, Instax cameras, crates of cans, a bathtub, 90’s gameboys, convertible car, bags of rubbish, 8 foot teddy bears and even a boat?? For Bookings Call (01) 7079899 © 2018 Number Twenty Two.